The face of this billboard displays fresh ad copy, so we know it’s not abandoned. 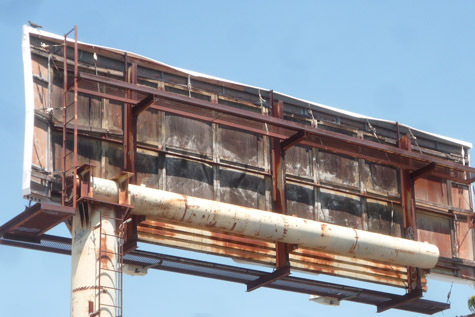 And even though Lamar, which owns more billboards in the U.S. than any other company, lost $58 million last year, it’s hard to imagine that it couldn’t have found some stray pennies to sandblast and paint this billboard (perhaps by forgoing one trip in the company jet.) But then, Lamar is known for its litigious nature, and has a number of active lawsuits against cities, counties, and other govermental jurisdictions around the country that have interfered in some way with its ability to put up billboards, so maybe they really do need everything they can scrape together to pay attorneys’ fees.